CraftingEz6 Coding - Page 18 of 19 - All about coding. Java coding, OOP coding, any coding oriented, especially Java. Here lies java coding, theory and algorithm. Example of real-life coding, and of course Application or even Games. Hello, how are you doing? well i am fine indeed.On my last post we talked about object inheritance, an inheritance in the viewside of coding. Today, we’ll still talk about OOP because there is so much we need to cover, now we’ll talk about Primitivedata types in Java. First I apologize if there is any mistake, any help or knowledge would be nice. Lets be done with the chit-chat and lets begin. You see… this will relate to primitive data types, “why?” you might ask, it’s because that int is one the 8 primitive data types that the Java language use, before we’ll get to the 8 of the primitive data types, let’s find the definition of primitive data types itself. Primitive data types is a data types that directly contains value, now like refference data types, that reffers to an object(we’ll talk about that later). int: By default, the int data type is a 32-bit signed two’s complement integer, which has a minimum value of -231 and a maximum value of 231-1. In Java SE 8 and later, you can use the int data type to represent an unsigned 32-bit integer, which has a minimum value of 0 and a maximum value of 232-1. Use the Integer class to use int data type as an unsigned integer. See the section The Number Classes for more information. Static methods like compareUnsigned, divideUnsigned etc have been added to the Integer class to support the arithmetic operations for unsigned integers. long: The long data type is a 64-bit two’s complement integer. The signed long has a minimum value of -263 and a maximum value of 263-1. In Java SE 8 and later, you can use the long data type to represent an unsigned 64-bit long, which has a minimum value of 0 and a maximum value of 264-1. Use this data type when you need a range of values wider than those provided by int. The Long class also contains methods like compareUnsigned, divideUnsigned etc to support arithmetic operations for unsigned long. float: The float data type is a single-precision 32-bit IEEE 754 floating point. Its range of values is beyond the scope of this discussion, but is specified in the Floating-Point Types, Formats, and Values section of the Java Language Specification. As with the recommendations for byte and short, use a float (instead of double) if you need to save memory in large arrays of floating point numbers. This data type should never be used for precise values, such as currency. For that, you will need to use the java.math.BigDecimal class instead. Numbers and Strings covers BigDecimal and other useful classes provided by the Java platform. double: The double data type is a double-precision 64-bit IEEE 754 floating point. Its range of values is beyond the scope of this discussion, but is specified in the Floating-Point Types, Formats, and Values section of the Java Language Specification. For decimal values, this data type is generally the default choice. As mentioned above, this data type should never be used for precise values, such as currency. char: The char data type is a single 16-bit Unicode character. It has a minimum value of 'u0000' (or 0) and a maximum value of 'uffff' (or 65,535 inclusive). Java programming language is statically-typed. Hello, how are you doing? well i am fine indeed.Since we talked about OOP much lately, let’s just get into one more important thing that OOP provides for us programmers or coders, which is an inheritance.We’ll get into it’s deep meaning and we’ll understands it more. First I apologize if there is any mistake, any help or knowledge would be nice. Lets be done with the chit-chat and lets begin. Okay, there is one more important thing in OOP that i want to talk about, which is an object inheritance, before we get to coding object inheritance, let’s just get the general explanation for inheritance. Inheritance is all part of a person’s estate/assets that is given to an heirs once the person is deceased or dead. An Inheritance basically is a cash endowments that is given to it’s younger heirs from the people that are deceased. If at the time of death a will is not in place, determining the rightful heirs can be a much more complicated matter. Wait!! we’ve gone to far now! Pheww, I lost my tracks. Let’s get back to coding, now we’ve understand what inheritance in general means, let’s get to OOP inheritance. If an inheritance in general lead to cash endowment or assets, coding inheritance is a bit different, just imagine a bycicle superclass is bycicle then after that comes another placements, types of bycicle, there are mountain bike, tandem bike etc… now the types of the bycicle are the class that inherits from bycicle, both of them had their own properties but will, have the properties that is passed down from superclass Bycicle, if you’re confused just read this, in coding an inheritance is when an object is based from a prototype of another object, using the same implementation (inheriting from object or class) specifying implementation of the object to maintain the behavior to be similar. Single inheritance: Where the subclasses of an object will inherit the features of one superclass. A class acquires the properties of another class. Multiple inheritance: Where one class can have more than one superclass and the object will inherit features from all parent classes. Hierarchical inheritance: Where one class of an object will serves as a superclass (base class) for more than one sub class. Hybrid inheritance: A mix of two or more of the above types of inheritance. General : Inheritance is all part of a person’s estate/assets that is given to an heirs once the person is deceased or dead. Coding : inheritance is when an object is based from a prototype of another object, using the same implementation (inheriting from object or class) specifying implementation of the object to maintain the behavior to be similar. Hello, how are you doing? well i am fine indeed.Last time we talked about OOP or Object Oriented Programming, we see how OOP can benefit us. We talk about it’s definition, it’s example, it’s advantages and stuff.Now we’ll talk about a compiled programming language, since Java is a compiled programming language. First I apologize if there is any mistake, any help or knowledge would be nice. Lets be done with the chit-chat and lets begin. Probably you already know that java is an OOP and compiled programming language, but what is the meaning of compiled programming language, what is it benefitial? well basically a compiled programming language is a programming language that compiles instruction that the operators write into bytecode or machine language with the help of an IDE.Another explanation is, A compiled language is a programming language that its implementations are typically based to be compilers (translators that will generate machine code from the source code that operators write), and not interpreters (step-by-step instruction executors of the source code itself, where there are no pre-runtime translation that takes place). Now you might wonder, what the heck is bytecode, machine code and source code is? good question, and as for that I will answer. What is bytecode? Bytecode, also known as p-code or a portable code, is a form of instruction that is set and designed for efficient execution by a software interpreter, that is its general definition, but… as for the Java bytecode, bytecode is a set of instruction that is created by the Java virtual machine. Each bytecode is composed from one or two bytes that represents the instruction (p-code). Not to much of a difficult things right? well then… let’s move to machine code. What is a machine code? let’s just divide it into 2 part: first is the machine, the machine represents our computers or any machine that run codes, second… code is a Code!!. Well as for the explanation is, a computer programming language that uses binary or hexadecimal insturction that consist of one and zero(bits) that the computer can responds to directly using it’s central processing unit (cpu). Phewww… easy right? now that you understand what machine code is you could get a deeper meaning in coding. Last one is our Source code, what is a source code? here is my explanation, source code is a list of text that contains commands or instruction created by operators in a read-able computer language that needs to be compiled to a machine code then will an executable computer program.The source code of a computer program is specially designed to be a facilites for the work of computer programmers, who then… will specify the actions to be performed by a computer mostly by writing source code. Now that you understand those 3 parts that consist in OOP, I hope you will be better at coding using OOP programming language, since now you understands its meaning and part. A compiled programming language is a programming language that compiles instruction that the operators write into bytecode or machine language with the help of an IDE. Bytecode, also known as p-code or a portable code, is a form of instruction that is set and designed for efficient execution by a software interpreter. 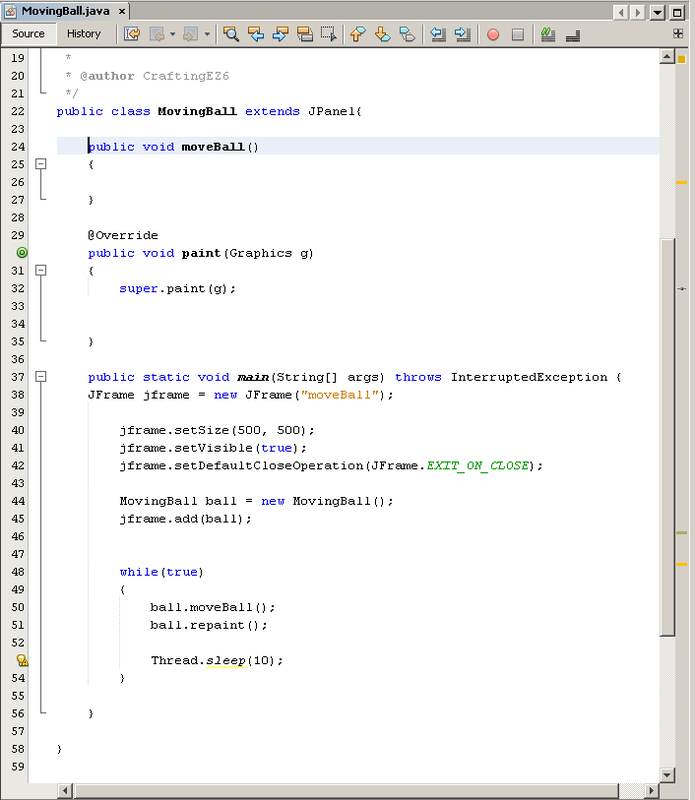 Java bytecode, bytecode is a set of instruction that is created by the Java virtual machine. Each bytecode is composed from one or two bytes that represents the instruction (p-code). a computer programming language that uses binary or hexadecimal insturction that consist of one and zero(bits) that the computer can responds to directly using it’s central processing unit (cpu). source code is a list of text that contains commands or instruction created by operators in a read-able computer language that needs to be compiled to a machine code then will an executable computer program. What is an Object Oriented Programming? (or we’ll call it OOP just for a shorter instance) OOP is just a programming language that often uses object as its coding bases. If you wanted to be more specific, Object Oriented Programming is a programming language model that is organized around “objects” rather than logic manipulating, OOP takes the view that what we really care is the object that manipulate itself rather than the logic required to manipulate them. It may sounds confusing, so you could just uses the first definition for your beliefs. Let’s talk about 3 of them, which is : Class, Inheritance and Object itself. First… Class, what is a class?, not that kind of class you go everyday, a Class in Coding, well here is my definition, a Class is a category of objects, a class will contain all of the common properties that belongs to any objects wether it’s different or not.We can also say it in another way, a class is an extensible program-code-template that used to create objects, and could also implements behavior. Second… an Inheritance, what is an enhiritance?, Just imagine like our world, that every object has something in commong, just for example, a monkey and a human, both of them are a living things, both of them has hands, legs, eyes, ears and mouth, but there is something in someway that seperate a monkey and a human, well it’s called an Inheritance, an Inheritance are the way of some objects will shares similarities like characters but in one if them has some difference, but still inherit something from another object. Well that’s pretty easy right? now let’s move to the last one. Third… an Object, what does an object means in programming? is it the same definition with the one’s that are in real life? well… an object in a programming language is a particular instance to a “Class” which the object itself can be combination of variables, function and data structures. What is the advantages that people sees in OOP, One of the most common advantages of object-oriented programming techniques rather than using normal programming techniques is that OOP would allow the programmers to create a somewhat a modules that do not need to be changed over and over again, when a new type of object is added to the program. A programmer can simply create a new object that inherits many of its features or functionality or properties, from existing objects. This makes object-oriented programs easier to modify. OOP is a programming language that often uses object as its coding bases or Object Oriented Programming is a programming language model that is organized around “objects” rather than logic manipulating, OOP takes the view that what we really care is the object that manipulate itself rather than the logic required to manipulate them. Java is an Object Oriented Programming. a Class is a category of objects, a class will contain all of the common properties that belongs to any objects wether it’s different or not. an Inheritance are the way of some objects will shares similarities like characters but in one if them has some difference, but still inherit something from another object. an object in a programming language is a particular instance to a “Class” which the object itself can be combination of variables, function and data structures. The advantages of OOP, A programmer can simply create a new object that inherits many of its features or functionality or properties, from existing objects. Each of them had their own pros and cons, you should pick one programming language that suites you heart, the one that you get comfortable with. Well you could learn both of them but after that choose one that you’ll go deeper with. a scripting language is a programming language that supporst script, program written for a special run-time environment that automate the execution of somekind a task that alternatively can be executed one by one with human operator. you just need to write this inside the notepad++ and save as Ball.html (you could name it whatever you want, as long it ends with .html) now after you save that as Ball.html you will see some changes that is applied to your code, now it has colors right it’s just a helping technique that will help programmer write their code more efficient and more easy. And you need to remember that you need to write this inside the <script></script> tags or it will never work. tada! we made it isn’t it fun, (tell me how you did it with your own name). You see those three programming language to be the structure to make web pages. Without one of those programming language a web page would be boring and not interesting, so if you want to make a web page make sure that you have all those 3 programming language implemented in your web page. A high-level programming language is a programming language that is more closer to human language and further from the machine language. What is an IDE ? Hello, how are you doing? well i am fine indeed.In my last post we make our way to create a program which is called a MovingBall, which is a program that makes a ball moves accross the screen and it could bounce off the side of the program and that is very cool and to make that program we use an IDE the IDE is called netbeans. Now, we’re going to talk about IDE, first i apologize if there is any mistake, any help or knowledge would be nice. Lets be done with the chit-chat and lets begin. First, we need to know what an IDE is, and why is it created. 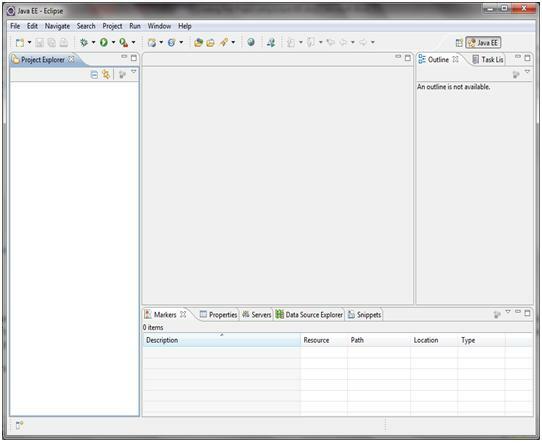 well in my understanding, an IDE is a software application that provides the computer with facilities for computer programming or software development, it contains a code editor or a compiler that the user acces through a single GUI (graphical user interface). It is created for computer programmers and software developers because it has a compiler or code editor that helps coding syntax, what do I mean by help? well simply it could add a sugestion on what you’re going to type and this is very helpful for a beginner coder because we don’t need to search the internet or read books and do other complicated things, it will automatically add sugestion on what we’re suppose to type or what we want to type, an IDE will serves developing environment on one or multiple coding language. You might ask, what is the functionality of an IDE? Just like I say before it has a compiler of code editor that helps coding syntax and there are many common features that is created in an IDE, such as debugging code or program and data structure browser etc… this is very helpful for its user because it can make a user quickly execute an action without needing to go to another application so that help maximize the productivity of coding with the help of its GUI (graphical user interface) and UI (user interface). what is an example of an IDE? 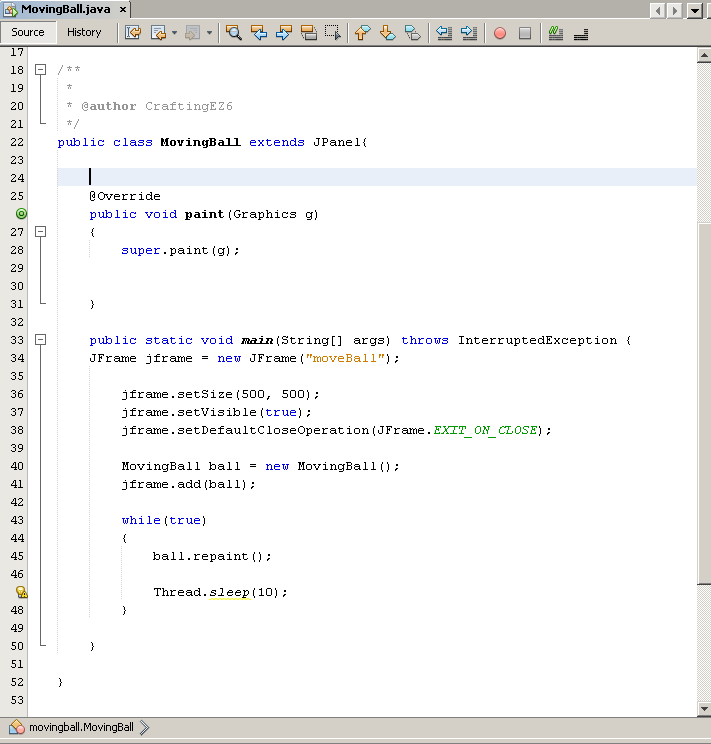 there are 2 IDEs that i know, first one is Netbeans and the second one is Java Eclipse. each of them serves the developing environment with their own way but you’ll find it very similar in some way. 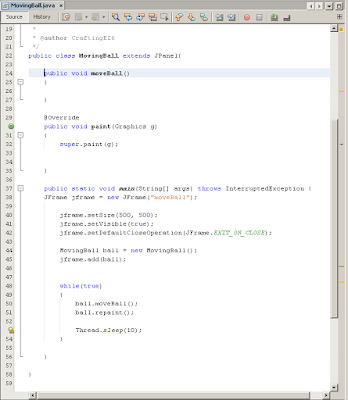 if you want to check it out here is the link : Netbeans and Java Eclipse. You may try both of them at first, but as you feel more comfortable with an IDE you should choose one of them to avoid complicated problem when you switch from one to another ID, you should choose the one that you thinks more comfortable and you feel good with it. 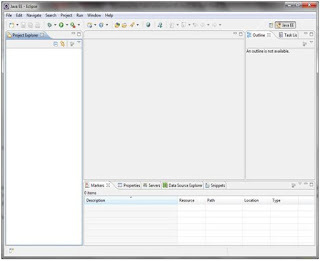 an IDE is a software application that provides the computer with facilities for computer programming or software development, it contains a code editor or a compiler that the user acces through a single GUI (graphical user interface). 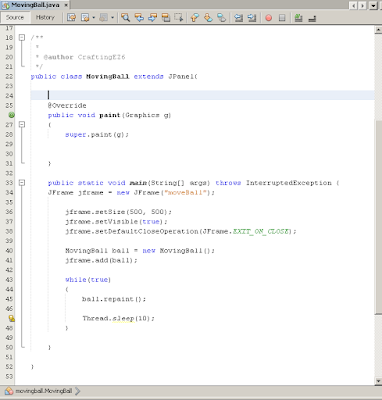 an IDE has a compiler or code editor that helps coding syntax. an IDE will serves developing environment on one or multiple coding language. an IDE makes a developer quickly execute an action without needing to go to another application so that help maximize the productivity of coding with the help of its GUI and UI. Posted on July 14, 2016 October 15, 2018 Author Rafif SantikaCategories code, Coding Tutorial, IDE, Java, Syntax3 Comments on What is an IDE ? Hello, how are you doing? well i am fine indeed. Today we’re going to continue our exercise making a ball move in Java, well on the last post we manage to make a frame for the ball to move, today we’re going to make the ball “move”. before we begin, first i apologize if there is any mistake, any help or knowledge would be nice. Lets be done with the chit-chat and lets begin! now the most importand thing is to draw the ball, we need to draw the ball in a method, can you guess what method we should use to draw the ball? correct, the paint method. Now you might ask “why didn’t we use the moveBall method instead?” well the moveBall method is a method to make the ball “move” and not to draw the ball, instead paint method is a method to draw an object, since logically “paint”, duhh!. congratulations, you just draw a ball in a screen, cool!!. now let me explain the steps that is needed to draw a ball like that.First we need to make a variable that contains the positions of the ball and the diameter of the ball, second we draw the ball.Now, I already explain what is variable in my other post, chek it out: Variables. Specifically we need to make an integer variable, for what you might ask, well it’s to determine the ball position. can’t do images because the ball wouldn’t move, lol. after you write that on you program codes, you run ! BOOM!! you have a fully working moving, bouncing ball program in Java, congrats!. After this exercise I hope you will get more comfortable and will more understand the Java world of Coding We have finished our exercise, so see you in another post!.